Registration is now closed for the 2013 Week in Washington. If you weren’t able to register or attend, you can still help us fight to end mountaintop removal by donating to support the event here. Week in Washington is an annual event organized by the Alliance for Appalachia and Appalachian Voices, bringing together citizens from the Appalachian region who are directly impacted by coal mining and citizens from across the nation who care deeply about mountains, health, clean water and social justice. No more excuses! This year, participants will ramp up pressure on the Obama administration to end mountaintop removal once and for all. In addition to our ongoing work to support the Clean Water Protection Act and gain new bipartisan support for the bill, we will begin conversations with lawmakers about the potential for economic transition legislation for the region. 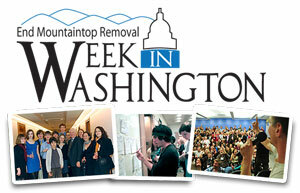 At Week in Washington, we�ll not only focus on how to work to end mountaintop removal in DC, but how to continue to fight this injustice back home in your local community. The 2012 elections set the stage for our work this year � join us as we push to make the issue of mountaintop removal coal mining a top priority issue in Washington. Alliance for Appalachia and Appalachian Voices. Learn more about our important mission by visiting www.TheAllianceForAppalachia.org.